Family favorite. After days of research I put together this recipe that comes close to some amazing Tagines we ate at The Grand Mosque (Moroccan temple) in Paris and later in Cannes (Paris 2007 w/ the Aglaure’s and Daniel Hieramente—and the restaurant in Cannes with Stan). Mrouzia (this salty-sweet tagine) is one of the most important dishes of Moroccan cuisine. It is traditionally made after the celebration of Aid el Kebir ("Feast of the Slaughter of the Lamb"), an occasion when, historically, a family would have large amounts of meat on hand. In the days before refrigeration, the lamb was cooked in copious amounts of fat and spices to preserve it. 1. Heat 2 TBL olive oil and 1 TBL butter over medium heat in a large 5-quart pressure-cooker or large pot. When the oil shimmers, add enough lamb to cover the bottom in a single layer without crowding the pan. Brown on two sides. Remove with slotted spoon to drain on paper towel-covered plate. Repeat with remaining lamb. Discard almost all remaining oil from the pot, leaving a teaspoon of oil. [It isn’t necessary to brown the lamb, I just like it that way. You can simply add the uncooked lamb in step 3]. 2. In the same pot, whisk together ras-el-hanout, salt, pepper, and ginger into the oil, and stir over medium heat until fragrant. Add 1-cup water and saffron. 3. Stir in remaining 2-cups water, onion, garlic, dried apricots, almonds, honey and cinnamon sticks or cinnamon powder. Note: in Ayurveda honey should never be cooked, so you can add the honey at the end, before serving, or add it now if you dare. 4. Cover with pressure cooker lid and cook for 10-12 minutes. Allow pressure to release naturally. [If not using a pressure cooker: simmer, covered, until meat is very tender, about 30-minutes. Uncover pot and cook over moderately high heat, stirring occasionally, until stew is slightly thickened, about 15 minutes more. We've made this in the crock-pot Sunday mornings (on the "high" setting for 4 hours, or "low" setting for 6-8 hours) so that it's done when we come home from church. *Ras-el-hanout is a popular blend of herbs and spices is used across the Middle East and North Africa. The name means "head of the shop" in Arabic, meaning it is a mixture of the best spices a seller has to offer. There is no set combination of spices that makes up Ras el Hanout, but there are over a dozen spices in most blends including cardamom, mace, nutmeg, cinnamon, and ground chili peppers. Some recipes include over one hundred ingredients, including some unusual things like dried rosebud, belladonna (potentially toxic), and insects like the Spanish fly beetle (banned in Morrocan spice markets in the 1990's), ash berries, chufa, Grains of Paradise, orris root, Monk's pepper, cubebs, etc. Usually all ingredients are toasted and then ground up together. Ras el hanout is also used in other dishes like pastilla, the Moroccan squab/young pigeon, the almond pastie, or is sometimes rubbed on meats, and stirred into couscous or rice. It is often believed to be an aphrodisiac. 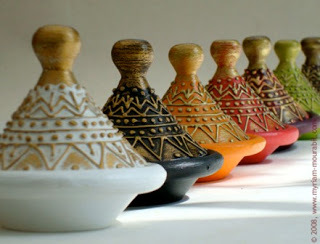 *I buy the ras-el-hanout (Zamouri Spices brand) from Amazon.com. A source for quality cinnamon, etc., is Penzey’s Spices, online.